Just like the gold market, silver traders saw the price of silver attempt to break out of its recent sideways price action but unlike gold the silver chart has exhibited a less defined pennant pattern. Yesterday’s candle ended the silver trading session as a “hanging man” with a small body but deep lower wick indicative of the struggle between silver bulls and bears but with the bulls prevailing as they drove the silver price up through both the 9 and 14 day moving averages. Such a move would have been aided and abetted by yesterday’s weaker dollar and equity market gains which followed the release of the preliminary GDP figures for the US which came in marginally better than expected. 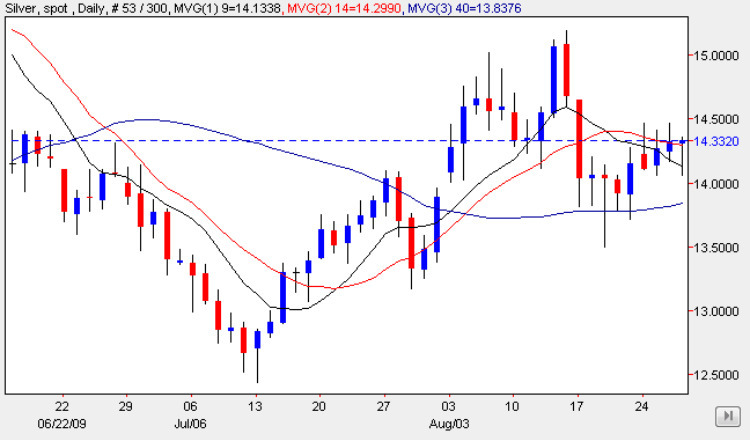 With the push through the 9 and 14 day moving averages takes silver prices past the $14.00 per ounce price point and traders will be looking at the $14.50-$14.60 price level which should be achievable if the dollar continues to weaken and equity markets hold onto their recent gains. However, before silver bulls get too carried away a combination of the holiday weekend and month end will mean that traders will be squaring positions so anything can happen. My suggestion is therefore to wait until early next week to see if yesterday’s price momentum can be maintained. Have a great weekend.